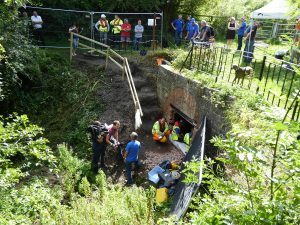 We would like to thank Rod Auton and the Chesterfield Canal Trust for giving their permission for us to include the following article and photographs on our website. 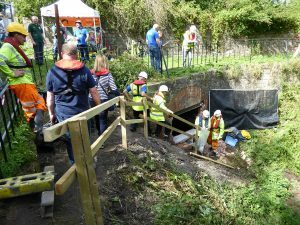 I am sure that all those who remember the canal in the Norwood area will be interested to read the latest news on the canal project and to see the wonderful photographs. 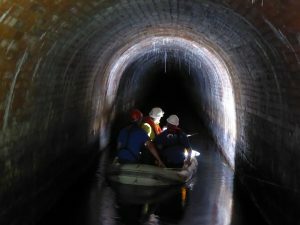 The Canal & River Trust aims to inspect all its tunnels every ten years. Our own Norwood Tunnel was due for inspection last year, but this was deferred. We thought that it was not to be done until December this year, so you can imagine our delight when we heard that it had been brought forward to the end of August. We were asked not to make any announcements beforehand because C&RT did not want the place to be overrun, nor for uninvited guests to break in. They did however say that they would allow a strictly limited number of Trust members to enter. They said that some of their staff would also be entering. We agreed that our Work Party would be the first in line, plus a few others including long term campaigners and those with specialist knowledge. Stephen Hardy, the C&RT Press Officer, did a superb job inviting the media. Both BBC Look North and ITV Calendar sent camera teams. Both went for trips inside and there were pieces on both channels that night. BBC Radio Sheffield sent a reporter and her piece hit the airwaves a couple of days later. The previous day (Monday, 22nd August), some contractors broke down the wall that seals off the tunnel and built some steps and a handrail down from the towpath. 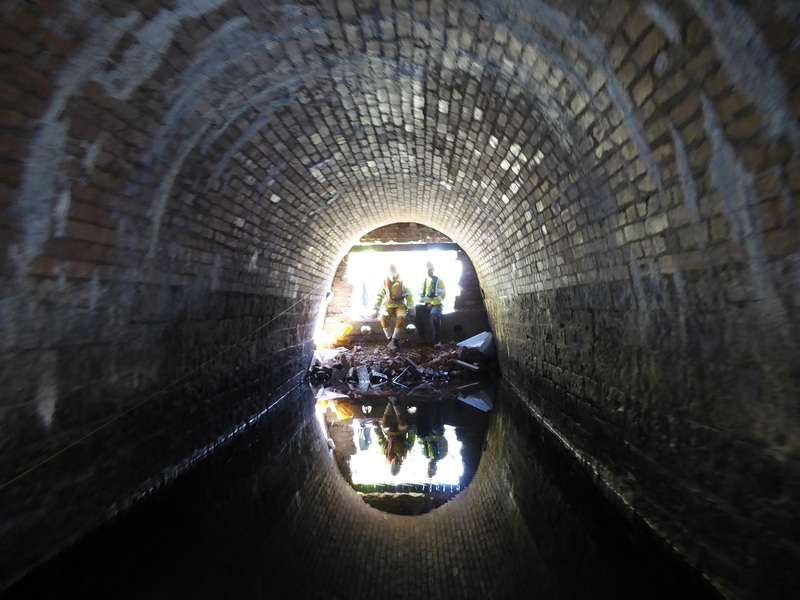 I went to have a preliminary peek and was stunned at how good the tunnel’s brickwork appeared to be. On the Tuesday morning, the C&RT tunnel inspectors went in for a preliminary survey and set up a communication system – phones and radios do not work. They had brought a small inflatable boat with an electric outboard motor with room for three people. Given that one had to be an engineer, there could only be two passengers at a time. The trips then started. The media went first, then the C&RT staff. Richard Parry, the Chief Executive of C&RT, asked the engineer how the tunnel measured up to the other tunnels that are in use every day. The reply came that it was in much better condition than many of them. Wednesday dawned hot and sunny. The engineers went in first to finish their inspection work. Then it was our turn. I was lucky enough to be on the first trip, because I had been given a special camera to make a video. It was stunning. The brickwork is superb, except for a few cracks in the mortar that can be easily repaired. It was cool – very welcome – and the stalactites at around 100 metres in were amazing – some nearly a metre long. Every 10 metres, the distance from the portal is painted on the wall, so you always know where you are. We went to 440 metres in, which is as far as boats can go. There is then a sunken pan and then a layer of silt. Apparently the first roof collapse is about 50 metres from Hard Lane. There is no room to turn the inflatable round, so you reverse in and go forwards on the way back. Turning round, I was amazed at how close the portal seemed. The tunnel has slight waves in the walls, notably at 200 metres in, but these are not noticeable at a distance – it appears to be dead straight. The engineers carry an air monitor with them in the boat which beeps continually. Periodically, they report back to the guys at the portal saying where they are, what they are doing and what the readings are on the monitor. When we arrived back at the portal, I was amazed to discover that we had been gone for nearly half an hour – it felt like five minutes. On the Thursday, the tunnel was again bricked up. We can only hope that it will be a lot less than ten years before it is next opened and that it will not be subsequently resealed at all. 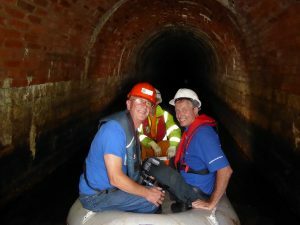 We are very grateful to C&RT for allowing us to visit the tunnel. Like their lock open days, this is a sign of how they are opening up their operations to the public. They are to be congratulated upon such enterprise – long may it continue.